A brief overview of how high intensity PEMFs are not just effective, but are completely safe. High intensity PEMFs were first used medically with MRI machines to any part of the body at any age. The peak magnetic field intensities in MRIs range from 2 Tesla to 12 Tesla. A Tesla is 10,000 Gauss. It is generally considered to be very safe. More than 1 million FDA-approved treatments have been given since 2008 as a safe and effective treatment for adults with Major Depression using repetitive transcranial magnetic stimulation (rTMS for short). rTMS uses repetitive pulses of a magnetic field to the brain of a maximum intensity of about 0.5 Tesla, or 5000 Gauss. 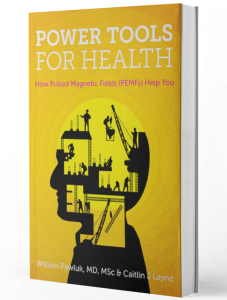 There are now a number of PEMF devices available with maximum magnetic fields varying from about 2000 G to 20000 G. Research is showing that HIPEMFs can be used safely, and effectively, with appropriate training, across a wide range of conditions all over the body. Here are some examples from the rTMS research. In 1 study, a single person had 70 treatment sessions over 12 months, or 420,000 pulses, with no side effects. One 75-year old had 130 sessions over 26 months with 156,000 stimuli. 7 people had 60 sessions over 12 months with 72,000 stimuli. In another study, healthy men had 13,000 pulses a day for up to 3 days in one week. This equaled 39,000 magnetic pulses over one week, one of the largest exposures of rTMS reported to date. No significant side effects were seen. Newborn brains are considered especially vulnerable. The brains of newborn rats exposed to high intensity magnetic fields did not show any evidence of harm. There are nearly 10,000 scientific articles about high intensity PEMFs, with most showing benefits from treatment and with very low risk. For more on this subject, check out my blog post on intensity matters here!